Wonder what my favorite undead teacher is up to today? 1. My favorite food seasoning is garlic (sorry, Spike). 2. "Fountains of Wayne is coming back to Portland January 16th" is music to my ears (and other key parts of my body). 3. Lucky is as lucky does. 4. My birthday is something I take very seriously. 5. Many people worry too much. Or don't worry enough. 6. Treats for Halloween was the last thing I bought at the store. 7. And as for the weekend, tonight I'm looking forward to not freezing to death while helping my children collect more candy than they will ever be allowed to actually eat, tomorrow my plans include rollerskating with the kids, and Sunday I want to savor the extra hour through hard sleeping! Today is my bro's birthday, yes Halloween baby! What you just now bought treats? Aren't you in league with "The Great Pumpkin"? Being first I exercised the right to ramble in this comment! Have a wonderful weekend, oh... and Go COWBOYS!!! Enjoy the weekend! Happy Trick or Treating! I absolutely forgot to put in Trick or Treat for tonight! My husband picked out the candy, and of course he choose his favorite kind. Now, he's praying that not too many kids come to the door! I love garlic too, but not on Halloween...cause...well, you never know. Damn that dude is HAWT! I worry too much...I admit it. I do. And its worse now that I have kids! Enjoy that extra hour...we don't change our time here in AZ so no extra hours for me, but then I don't lose one either in the spring! LOL - we have the same answer for Luck Is.... :o) Great minds think alike! I worry too much about perceived social slights .. and too little about housework and clutter piles. Hmm, but the reason I have clutter piles is I worry too much about throwing the wrong thing away. So I guess that gets counted in the worry too much column. TGIF!!! Have a fun & spooky Halloween!! Happy Halloween!!!! 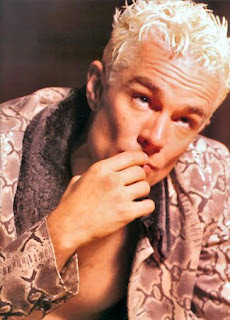 Sorry I can't say anything else, I'm distracted by the picture of James Marsters... mmm snakey. Oh, Spike, how I love and miss you so. His stint on Smallville as the Brainiac did not even tap into 1/100th of his Spike abilities. I have lost my sleeping juju--I miss it desperately.